Which superstar are you most looking forward to seeing fight again - Pacquiao or Mayweather? Which superstar are you most looking forward to seeing fight again – Pacquiao or Mayweather? Manny Pacquiao has been out of action for almost a year, Floyd Mayweather has been out of the ring for a slightly shorter amount of time (boxing last August but, against Conor McGregor and not in a “real” fight according to many fans, of both boxing and MMA) – yet both superstars are set to return to action this year. Pacquiao, 39 and last seen losing in an upset to Jeff Horn, will face Lucas Matthyyse in Kuala Lumpur on July 15, while Mayweather, 41 and last seem beating Andre Berto in a “real” fight, is training for a return later this year – but in MMA. Which return are you most looking forward to? Are you in fact looking forward to the return of either superstar? Both men have achieved, individually and between them, pretty much all the there is is to be achieved in boxing. Millions of dollars earned? Check. Multiple world titles won? Check. A guaranteed place in The Hall of Fame earned? Check. So why go on? With Floyd this is an easier question to answer: more cheques, paychecks. He’s not known as Money for nothin; Mayweather is known as “Money” because be loves it, he cannot get enough of it. And, say what you will, a Mayweather cage fight will generate millions of $, with many of them going Floyd’s way. 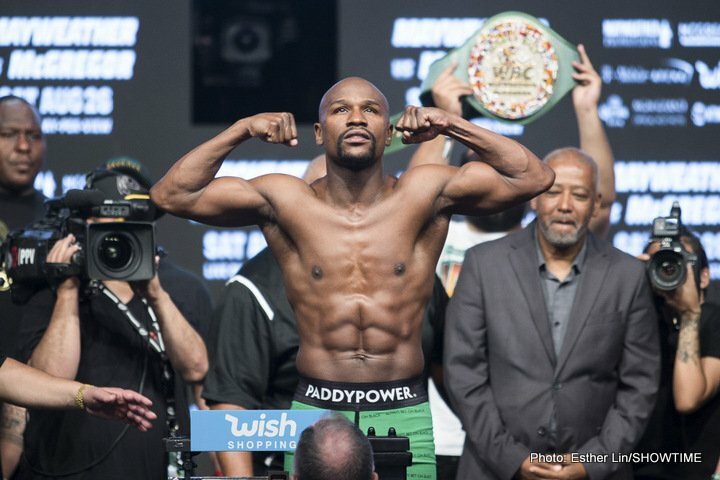 This is why Mayweather is going to fight again – for the dough (that and the knowledge that whatever happens inside the cage, his perfect 50-0 boxing record will stay perfect). With Pacquiao it could be a little more more complicated, or maybe it is just as simple. We’ve all heard how generous Pacquiao is with his money, some that know him so alarmed by his charity that they fear he may go broke one day. So maybe the urge to fight on is financially inspired in Manny’s case too. Then again, Pac-Man is a born fighter, a man who – like the great Roberto Duran – will very possibly fight until he is no longer able to do so. Yes Pacquiao has his political career, but does this really satisfy him the same way as fighting does? Neither superstar really needs to fight on, not in the common meaning of the word, yet in a strange way, neither all-time great is able to quit. Boxing is like a drug, retired heavyweight great Lennox Lewis once said (Lewis being one of the few to actually go out on top, health and money secure). Are Mayweather and Pacquiao both addicts? Whose return are you most looking forward to? A better question might be, which fight are you most likely to pay for? You are here: Home / Boxing News / Which superstar are you most looking forward to seeing fight again – Pacquiao or Mayweather?